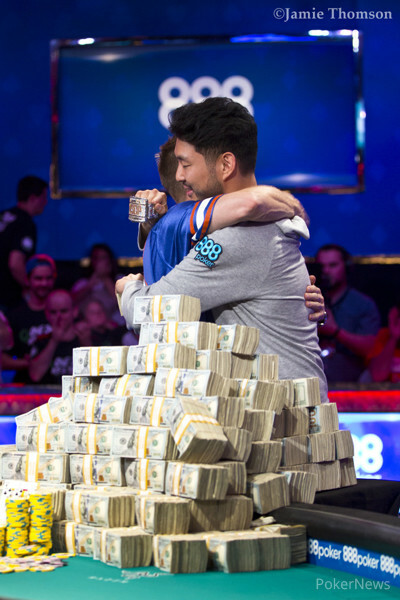 While John Cynn might not have the distinction of final tabling the WSOP Main Event twice, he has pulled off an amazing feat in poker by finishing in 11th in 2016 and bettering that finish with a final table appearance just two years later. Cynn’s 2016 Main Event run fell short when his stack dwindled to under ten big blinds and he got it in with queen-ten, running into (eventual runner-up) Gordon Vayo's ace-king in the big blind and failing to catch up. 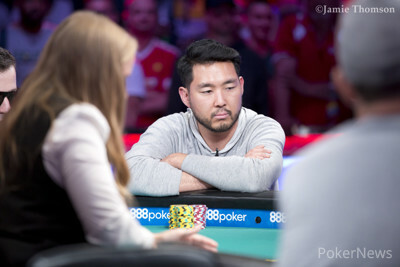 That bittersweet run earned Cynn $650,000 — his previous best score being just under $20,000 for a 59th-place finish in the 2015 Millionaire Maker. In the two years since his 2016 Main Event run, Cynn has added $200,000 in tournament winnings to his credit and he shared with PokerNews during a break that he’s happy to be back under the lights of the Thunderdome. His experience this time around has been a bit different, having been here before. “I’m definitely more comfortable than before, which is nice. It could be either because it’s my second time, or because I have a bigger stack. Cynn’s Main Event trajectory has seen him chip up substantially on every day of the tournament besides a stagnant Day 2, as you can see below. On Day 6 with blinds at 100K/200K/30K ante, Cynn was sitting with just over 4 million chips on the button and saw a very active Nirath Rean open to 450,000 under the gun before Daniel Tang flat-called. Cynn shipped with ace-jack and Rean tank re-shoved. A clean runout followed and Cynn scored a big double up that got him going. He would end the day right in the middle of the pack with 14,750,000. By the second break on Day 7, Cynn had more than doubled what he started the day with, sitting at 32,200,000 and we asked how he got all those chips. At the end of the night, he really only recalled one major hand that propelled him on Day 7, and he wasn’t involved in many big confrontations throughout the day. "I picked up pocket sevens against pocket fives early on and that gave me a stack to work with. From there, I was just able to play my game and kind of coasted the rest of the way." Coasting in the Main Event: every poker player’s dream. "Honestly, I don't even know what to say. It's pretty surreal. It hasn't really hit me yet." For Cynn, after losing a chunk of his stack in the final level of the day, he was ready to burst that final table bubble that eluded him last time, and move on to Day 8. "I'm happy the bubble popped when it did. It wasn't a great level for me so now I will have some time to rest." In one of the biggest moments of his career, Cynn will be sure to do everything possible to give him the best chance, and he knows this final table will be no cake walk. "Ya, we'll probably be reviewing some stuff tonight. Everyone is at the final table for a reason. They all have their strengths so of course you're going to need a little luck." Already having outdone his previous best 11th-place finish in the Main, Cynn is surely looking to capture his first WSOP gold. And the $8.8 million would be nice too.